One of my foreign friends loves the Philippines so much, primarily because of the people and the food. He likes eating meat, and he finds the country a rich source of protein (he’s practicing the Paleo diet). 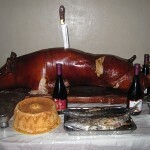 The delicious lechon (roasted pig) is ever-present in all celebrations. 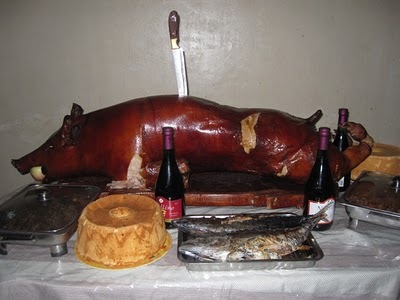 For any occasion–birthday parties, wedding anniversaries, Christmas celebration, and even in your ordinary Sunday get together–the lechon is always present. This all-time favorite Filipino cuisine is also a dish that Filipinos are well known for. It’s not really easy cooking lechon; check out how it’s made: How to Cook Lechon. 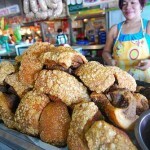 Despite its complex preparation and cooking process, however, the lechon remains highly in demand. This is another Filipino that is best known for its distinctive taste. The manner of preparing it–which consists of marinating (soy sauce, vinegar, garlic, etc. ) the meat, adds a lot to the flavor. Adobo can either be in the form of chicken (adobong manok) or pork (adobong baboy). Some even make adobong gulay (vegetables) and adobong isda (fish). Pancit bihon, to be exact, is one of the traditional Filipino foods that you will ALWAYS see prepared in any celebration. It is present especially on birthday celebrations since it signifies long life. It’s a healthy dish because of the fresh vegetables added to it, including cabbage, carrots, celery sticks, and many others. 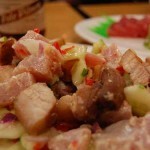 Kinilaw is raw fish or meat, the Filipino equivalent of sushi. 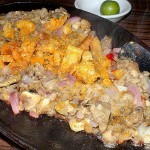 It’s mostly used as pulutan, a dish accompanying beer or liquor drinking. It’s easy enough to make; just buy fresh fish then season it with vinegar, onion, ginger and other spices. Dried fish can be overpowering because of its smell, but when you get to eat it, you will definitely like the taste. Fresh fish is salted and then sun-dried. It can last a long time even without refrigeration. What’s your top Filipino food? Is it included here?